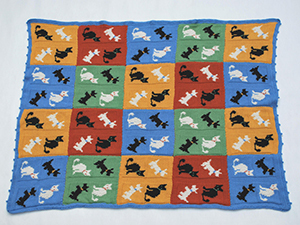 The Cats and Dogs blanket has been designed for Knit for Peace by Sasha Kagan. Made up of 20 hand knitted squares (small and portable for knitting on the go) then finished with a crochet border., the iconic cat and dog motifs are knitted in 100% UK ALPACA, grown in the UK and spun in Devon. The blanket measures 117cm by 94cm (46” by 37”). All profits from sales of the kit and pattern go to supporting Knit for Peace. To purchase the kit, please click here to download the order form.